Apple is known for leading the smartphone build trends and it has been doing this for a very long time. Other Chinese OEMs used to copy the design trends and bank on the elite designs. However, this cannot be said to be true for recent times. For the past two years, certain Chinese brands like Huawei and Xiaomi have become exceedingly innovative. The companies have continued to enhance their camera quality. The famous DxOmark ranks the recent Huawei and Xiaomi’s phones in one of the top-rated smartphones list. The recent gain in the innovation of these Chinese brands has initiated an interesting competition in the smartphone industry. Apple needs to do better to outsmart its competitors now. Overall, Apple still ranks above all Chinese OEMs and the company will come up with this year’s iPhone XI model. iPhone XI – What’s coming? The biggest innovation of the iPhone XI is the super wide-angle and the rear TOF lenses. This is not a new feature. The Chinese giants, Xiaomi and Huawei, have smartphones with super wide-angle lenses and these cameras can shoot considerably good landscape images. However, it is expected that Apple will come up with a unique super wide angle lens if it wants to make an impact. 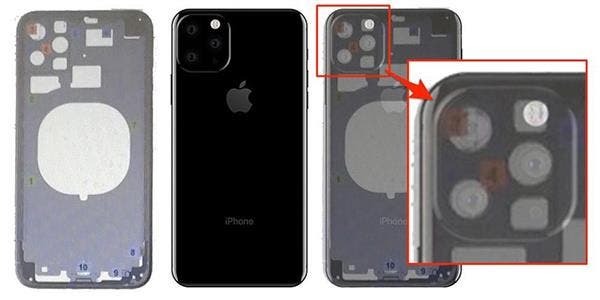 Apple’s iPhone XI rear lens consists of three main lenses. A normal wide-angle lens (main lens), a 2x zoom telescope sensor and a super wide-angle lens. As a result, the iPhone XI’s rear lens position cannot be as vertical as the iPhone X. Using this as a probable design tweak, Apple is changing the rear camera to a square structure. TOF cameras have the following advantages over structured optical sensors. The TOF sensor component is simpler. In theory, only one emitter (lens) is required, and at least three structured lights are required. Structured lights: One floodlight + one infrared recognition lens + one infrared mapping point projector. It is the calculation of the return time, so the interference against ambient light is significantly stronger than the structured light technology that needs to identify the image, and the accuracy is higher. It calculates the return time, no need to image the object, so the effective ranging distance is much farther than the structured light. The TOF sensor can directly get the return time. While the structured light requires photography and comparison to calculate the distance. Therefore, TOF will save CPU resources and greatly shorten the recognition time.